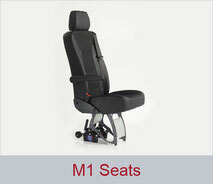 AMF-Bruns seating solutions, so-called Smartseats, are known for safety and the highest quality levels. All models have been tested and approved based on the latest UN/ECE regulations for M1 and M2 vehicles. When it comes to design, materials and comfort, Smartseats leave nothing to be desired. The Smartseats are tested in combination with the Smartfloor aluminium floor and are available with different seat bases (flexible Smartlegs or fixed pointed feet), depending on use. 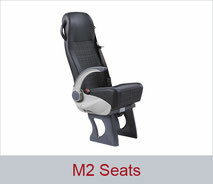 All Smartseats are optionally available with a wide selection of seat covers.